The signature-based model of classic antivirus (AV) and the teams and infrastructure behind it are increasingly stretched to keep up with the pace and sophistication of today's financially motivated malware developers. 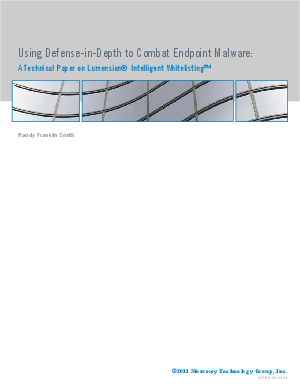 This technical paper, written by Randy Franklin Smith, takes an in-depth look at Lumension® Intelligent WhitelistingT, which takes the concept of a static application whitelist and applies it to the real world of hundreds or thousands of unique, ever-changing PCs with a practical approach that does not involve the upfront burden of analysis and testing necessary with traditional whitelisting solutions. Learn how this innovative solution works and how it integrates several endpoint security layers together to provide and improved defense that doesn't impact productivity.